Friday July 27, 2018: Billy and Nick fight, Mariah reaches a difficult decision, and Nikki gets hired. In the hospital, Hilary weakly smiles as she thanks Devon for her beautiful wedding day and tells him she’s so happy she gets to spend the rest of her life with him. They revel in being husband and wife, and Hilary assures him they’ve wasted no time. Devon and Hilary share a champagne toast using the glasses Shauna gave them. Devon regales her with visions of the places they’ll travel together. They talk about making ‘Hevon’ babies before Hilary wants to be real – how much fighting will they do? Devon teases they’ll do a lot of making up – they’re forever. They share a deep kiss, then Hilary whispers, “We don’t have much time…” Devon gets into the hospital bed with her. He doesn’t remember not loving her; he recalls how he felt when things first happened for them. Hilary teases when she looks at him, she thinks about 7-layer bars – he told her his grandmother made them. Devon sheds tears as Hilary asks him to make her service a celebration, then later, to move on – there’s an amazing woman out there who will give him kids and a family. Hilary assures him she had a blessed life…she got to marry him and hear her child’s heartbeat; all of her dreams came true. His dreams can’t end with her. She kisses his head as he burrows into her neck. After, Devon holds Hilary as she asks him to be there for Shauna, who is special, and needs him. Hilary says whatever she thought she wanted, she only ever needed him. Devon replies that she has him forever. Hilary tears up; maybe she did do something right. Memories from their relationship flash through their minds. Devon recalls a story she told him about the soul sisters becoming the stars in the sky, then sobs as he realizes Hilary has passed away. At home, Phyllis contemplates Billy’s contact information on her phone. Lauren arrives – she’s looking for Billy who missed a meeting. They discuss the wedding. Lauren hopes Hilary felt like a princess. Phyllis relays that Devon married Hilary because it was their last chance. Lauren’s dismayed Billy wasn’t there to support Phyllis, and suggests they go for drinks. Billy arrives at the Abbott mansion, where Kyle assumes he’s been at Hilary’s wedding with Phyllis. Billy didn’t want to encroach, and asks Kyle if he’d like to go blow off steam. In Crimson Lights, Sharon talks to Tessa about Mariah. Tessa assures her there are no lies left; she promises to always protect Mariah and never hurt her. Sharon just wants her daughter to be happy, healthy, and safe. At home, Mariah encounters Nick, who asks about the wedding. Mariah says it was beautiful, with a quiet joy, but she didn’t realize it was the last time she’d see Hilary. Nick lets her know he loves her, before leaving. Sharon arrives and enthuses that Tessa seems committed to Mariah, and suggests she be in the wedding. Mariah says that would be great. When Sharon goes upstairs, Mariah exits with her packed bag. Outside, she gets into a car with Tessa, who realizes she’s not going with her. Mariah intended to, and cares deeply, but she has family and friends; connections there. She hopes Tessa can find Crystal and they can be together someday, but Tessa nixes that. She urges Mariah to give someone new her love one day. They cry and kiss goodbye. In the Club dining room, Victor’s impressed with Victoria’s recent work, and has someone in mind to hire. Up at the Dive Bar, Abby joins Jack and Nick, who discuss Hilary before talk turns to business. Abby has an innovative idea and will submit a proposal, but Nick doesn’t want to wait that long. Victoria and Victor appear, followed by Nikki, who muses when they invited her to a meeting she didn’t know she’d need a flakjacket. Billy strolls in, and Summer and Kyle look wary as he shouts that drinks are on Jabot. Jack confronts Billy about not being there for Phyllis at the wedding. Billy tells him to stay out of his personal life. Phyllis and Lauren overhear, and Lauren sneers that Billy’s being a soulless jackass before questioning his feasibility study. Phyllis accuses Billy of using Fenmore’s to push her out. Lauren moves off as Billy and Phyllis start bickering. Nearby, Victor and Victoria ask Nikki to step in at Newman Enterprises. Nikki notes it pits her against her son – is this about her skill-set or spite? Nick eavesdrops as Nikki assures them she’s in. He walks away before she says she won’t take the family to war. Nick joins Phyllis and Billy, who snarks about him having an empty building. 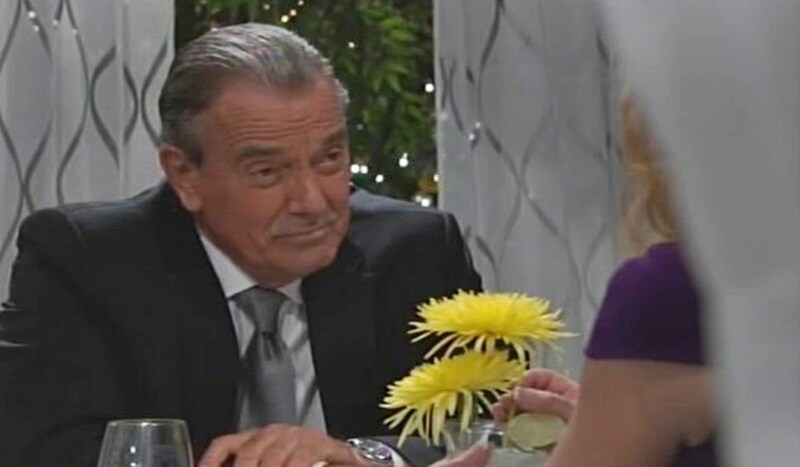 Nick thinks Fenmore’s might be a good fit. Summer appears, and questions if he just threatened to steal business from Jabot. Nick continues to needle Billy about the face he’s putting on Jabot. He knows about the gambling, which affects his kid. Summer and Phyllis are better without him around. Billy implies Nick’s acting like Victor, while Nick tells Billy he’s self-destructing and isn’t worthy of the Abbott name. Billy swings and a fistfight ensues. Nick warns Billy he doesn’t want him as an enemy. Summer tells Billy the best way to get over someone is to get under someone new.